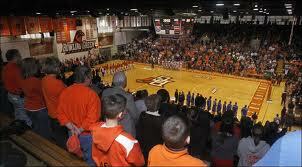 I’ve been in Anderson Arena, on the Bowling Green State University campus, many times. Whether passing through its lobby to avoid cold, wind, and/or rain, attend a basketball game, concert, or hear a US President; it is a place dear to my past. I was there the day President Ford made a campaign stop. Unfortunately, he had gone through several recent assassination attempts, yet those of us who can remember Squeaky Fromme and Sara Jane Moore, may also recall the night when a popping of a camera flashbulb created temporary havoc. Yep, that was in Anderson Arena and I was there. Anderson Arena is the place I attended concerts and saw acts as Yes (with Rick Wakeman), Jefferson Starship, Doobie Brothers (early in their career), and Bachmann-Turner Overdrive. Who knows how many sporting events I attended at Anderson Arena, but as a sports venue, it’s far from luxurious … actually sparse … but a good place for fans. 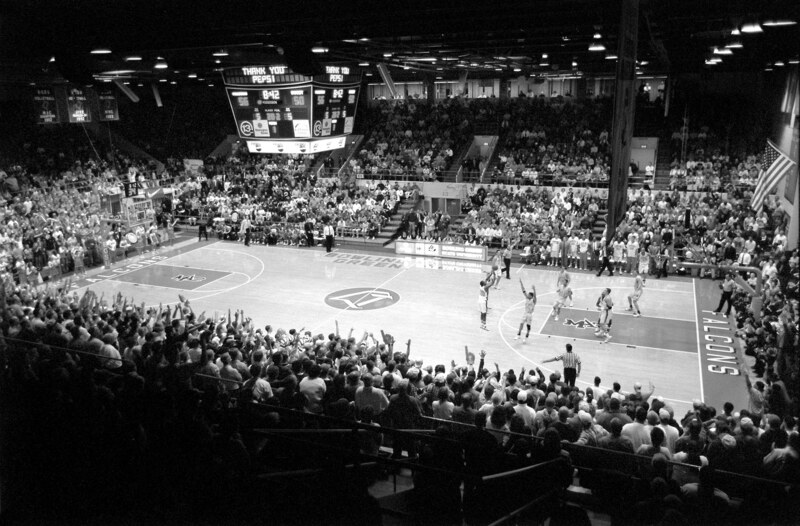 With fans near the court, The House that Roars was a tough place for opponents. Earlier this month, Anderson Arena hosted its last Falcon basketball game as next season brings a new venue. Little did I know at the time, one of my lasting memories is seeing a partially deflated basketball in the lobby’s trophy case that is connected my life-after college in Cincinnati. The date on the basketball was February 16, 1963, with the following score inscribed: Bowling Green 92, Loyola Chicago 75. Those Ramblers had come to town undefeated (21-0) and ranked #2 in the country – actually behind the two-time defending champion Cincinnati Bearcats, (where I earned my Masters and now attend sporting events). At the end of the year, Loyola would have a late-game rally to defeat the Bearcats in the national championship game – which is also one of the earliest college basketball games from my childhood memory. On that night in February of 1963 though, the night belonged to the Falcons, who were very good. They eventually won the MAC championship, and were part of the 26-team March Madness. They beat good teams, and lost to other good teams in close games. On that night, the Falcons never trailed, and were comfortable ahead most of the game … and the basketball from that night is in the trophy case. Two Falcon legends gave this team an inside-outside threat. Howard Komives, the pure shooter, went on to a 10-year NBA career. Nate Thurmond, the inside rebounder and scorer, was not only an All-American, but had a long, outstanding NBA career, and a member of the Basketball Hall of Fame. Coach Harold Anderson is also in the Basketball Hall of Fame. 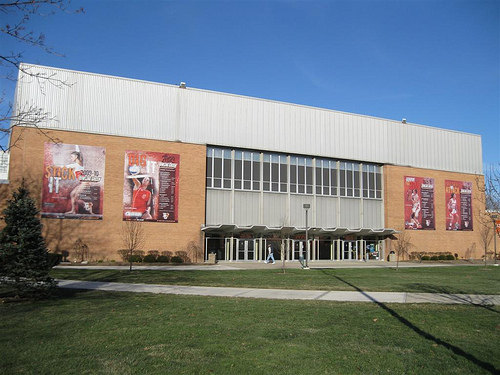 Although Anderson Arena will now be quiet, yet the memories of the roars will live on. I will always remember that basketball in the trophy case, and know that I would have loved to be there on that night. Inside black and white picture used with permission from PepperGuy, Grant Cummings. I earned by undergrad degree at Bowling Green State University, thus a proud Falcon. The end of 2009 marks the end of celebrating two monumental sports moments from years gone by: the 1984 NCAA Hockey Championship and the 1959 NCAA Football Championship. I imagine someone is scratching their head about the 1959 gridiron feat because references list Jim Brown-led Syracuse as national champions, but the Falcons were the NCAA College Division (Small College) champions. The team numbers are impressive: 9-0-0 and outscoring opponents 274-83 … and to think that rival Toledo scored 21 points while the defense held 6 opponents to single digits. Here are some notes about the personnel. Here’s a short article about the team. By the way, the players above and below with hyperlinks are enshrined in the BGSU Hall of Fame. Twenty-five years later (1984) the Falcon icers won the national championship. Although BG had a stellar record (31-7-2) and ranked #2 in the final poll, an OT loss to Michigan State in the league championship game sent BG to Boston to face the Terriers in two-game total-goal series. Having lost by 3 the first night, BG roared back to win by 4. A rematch semi-final win over MSU then vaulted the Falcons into the finals. Trailing by 3 to Minnesota-Diluth in the final period, the Falcons roared back to tie with 1:47 left, and then eventually winning in the fourth overtime! Here are some of the roster notables. One has a GM Corvette plant and accompanying museum, the other has the National Tractor Pull Championships. One has a population of about 30K (in a rural area) and the other 54K (yet more of a metro area). One became a town in 1798, the other in 1855. Both have similar elevations above sea level (547 & 696) and each located along an interstate highway. Both have public universities. One is on plains flattened by the glaciers, and the other has a gentle roll. One is the Central time zone, the other is Eastern. One occupies about 10 square miles, the other 35. Probably because of early history, there’s a slight difference in their pronunciation: BOWL-ing GREEN and BO-lin grin. One is in Ohio and the other Kentucky. One is home to the Bowling Green State University (BGSU) and the other the Western Kentucky University (WKU). One has the Falcons and the other the Hilltoppers. One has a college on the hill, and the other’s college created a hill from the removed soil when building a large pond. I’ve lived in Ohio all but the first 3 months of my life. For some reason people confuse these two universities. I first discovered this in my youth after telling people I was attending Bowling Green, I would get comments like “The one in Kentucky or Ohio?” “Have you gone to the Corvette Museum?” Even after moving to Cincinnati for my adult years, I’ve occasionally encountered similar confusion. Well, Bowling Green is also found in Florida, Missouri, South Carolina, and Virginia, but none of these are college towns. Bowling Green is also in New York City as the city’s oldest public park, but it’s not a town in itself. Although nobody has ever confused my Bowling Green with these places, at least nobody has ever related me to Fruit of the Loom Underwear that has a manufacturing facility in Bowling Green. After all, I prefer Hanes. It was the summer of 1972 and the Munich Summer Olympics. Although an Olympiad of tragedy, it was also one of pride. We Bowling Green students were excited that one of our own was in the Olympics. The coach Don Nehlen’s young Falcons were coming off a successful year and picked by many to win the MAC. After winning at Purdue and a 3-0-1 start after 4 road games, a tough Don James coached Kent State team burst on the scene at our home opener. That was my first exposure to HOF LB Jack Lambert, who made sure there was no Tangerine Bowl for us. Randy was a Pirates fan, and October was the memorable Reds-Pirates playoff. Who could forget Johnny Bench’s game-tying HR in the bottom of the ninth! The eventual winning run for the Reds scored on a wild pitch by Bob Moose. To this Randy, Randy still steams about the game. The Falcon basketball team was horrible the year before, but was loaded with a promising sophomore class. (Remember, freshman didn’t play in those days). The next three years were the same for basketball and football; high expectations and always the bride’s maid yet never the bride. I loved Falcon hockey. The season brought us future ’76 Olympians Bob Dobek and Doug Ross; the latter was sitting out his transfer season. Little did I know that they were the prelude for a future Falcon to be the first to win an Olympic Gold and a Stanley Cup the same year; actually months apart. In the spring, Coach Jack Vivian jumped up to the newly-formed WHA, which that brought us Ron Mason, who would become the winnest coach in NCAA hockey history. And I’m sure Scott Hamilton skated between periods. I never imagined that technology would remind me of those events 36 years later; let alone share it with others. After reading Basic Blaganomics about the Dolphins perfect season, Randy and I talked and laughed about the prediction, which led us into other events of that year. He still hasn’t forgiven Bob Moose, he won’t listen to my recording of the homer or the pitch, and I haven’t found the pitch on YouTube – at least not yet. 1972-73 was an interesting sports year for me; so here’s Dave Wottle’s 800 m race as called by the late, great Jim McKay …. and to think the Olympian was in one of my chemistry classes. Many of us recognize Scott Hamilton, the professional figure skater. Most of us remember Scott Hamilton the Olympian. I’m one of the much smaller number who was fortunate to see him skate during his teen years. I attended (and am a proud graduate of) Bowling Green State University. Scott grew up at Bowling Green as his adopted father was a biology professor at the university. And yes, Dr. Hamilton was one of my professors for a portion of freshman biology. As an avid Falcon hockey fan, we were treated (between periods, once a year) to a skating exhibition by a young townie who had won many competitions. Yes, that was my introduction to Scott Hamilton; so it’s been a pleasure following his career. Recently I saw an interview with Scott on the Today show as he’s promoting his new book: The Great Eight: How to be Happy (Even When You Have Every Reason to be Miserable). We know Olympic Gold Metal winner, the skating commentator, and professional performer, but Scott Hamilton faced medical obstacles throughout his life. Yet he remains positive and full of life. He focuses the book on the eight secrets for dealing with challenges. I haven’t read the book, but this is a great interview with a positive message and also humor. If the book is anything like his personality, it’s got to be a great read. Here are three links: the Today show interview (7 minutes), a written interview from years ago at the Academy of Achievement, and the book on Amazon.